Sansui RA-500 Reverberation Amplifier acquired from the family of the original owner. Thoroughly tested this reverb amp works as designed. It's barely noticeable even when viewing from the rear (dedicated photo.). Vintage sansui AX - 7 analog mixer reverb 4 channel audio mixer 1978. Shipped with USPS Priority Mail. Inputs and outputs are only tested for analog, not digital, connections. Midi function is only tested on sound modules, and only for signal from or to the unit. Units that we have no experience with will be described to the extent of testing in the first paragraph. IN LIKE NEW CONDITION. Sponsored by SYMBIOTEC. Has 1/4 Guitar and vocal input jacks and works great. The RA-500 is beautiful, excellent condition, near mint (I used only use "mint" for NEW, sealed in box). Near mint. The box is excellent but has a few dings. Source: Sansui RA-700 reverberation amplifier (100/117/220/240 VAC). Item: jack assembly - RCA (4 jacks). The following photos show the actual chassis that the part is sourced from. CLASSIC STEREO PARTS. Source: Sansui RA-700 reverberation amplifier (100/117/220/240 VAC). The following photos show the actual chassis that the part is sourced from. CLASSIC STEREO PARTS. If the part you need looks. Parts Availability. Manual is from our family. Picture of actual manual. Original Printed Factory Manual. that closed in the early 90's. for over 20 years. Sansui RA-990 Reverb Amplifier. ::: REAR CASE PANEL :: -REPAIR PART-. Sansui RA-990 Reverb Amplifier. -REPAIR PART-. Sansui RA-990 Reverb Amplifier. ::: SMALL KNOB - Fits Pan/Level Positions for Channel 1 or 2 :: -REPAIR PART-. Source: Sansui RA-700 reverberation amplifier (100/117/220/240 VAC). Condition: good: lamp is good. Item: socket/lamp - power. CLASSIC STEREO PARTS. Parts Availability. Parts Substitution. The following photos show the actual chassis that the part is sourced from. Source: Sansui RA-700 reverberation amplifier (100/117/220/240 VAC). Item: cover plate. The following photos show the actual chassis that the part is sourced from. CLASSIC STEREO PARTS. Parts Availability. 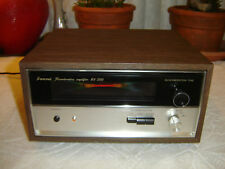 SANSUI RA-700 REVERB UNIT, DISPLAY PARTS ECT. PARTS. These parts are untested. These parts were pulled from a unit that didn't power on. The fuse holed was broken. Source: Sansui RA-700 reverberation amplifier (100/117/220/240 VAC). Item: reverb display. The following photos show the actual chassis that the part is sourced from. CLASSIC STEREO PARTS. Parts Availability. Source: Sansui RA-700 reverberation amplifier (100/117/220/240 VAC). Parts Substitution. Item: switch - power. CLASSIC STEREO PARTS. Condition: good. Parts Availability. The following photos show the actual chassis that the part is sourced from. Source: Sansui RA-700 reverberation amplifier (100/117/220/240 VAC). Item: board/switch/knob - reverberation (knobs are glued on). Parts Substitution. CLASSIC STEREO PARTS. Parts Availability. The following photos show the actual chassis that the part is sourced from. Sansui RA-990 Reverb Amplifier. -REPAIR PART-. You get exactly what is pictured - nothing more, nothing less. Sansui RA-990 Reverb Amplifier. ::: Power PCB, Part No. This board is functional, but has never been recapped. It was powering the unit just fine, but has not yet been updated. Again, unit is functional, but sold as-pictured.